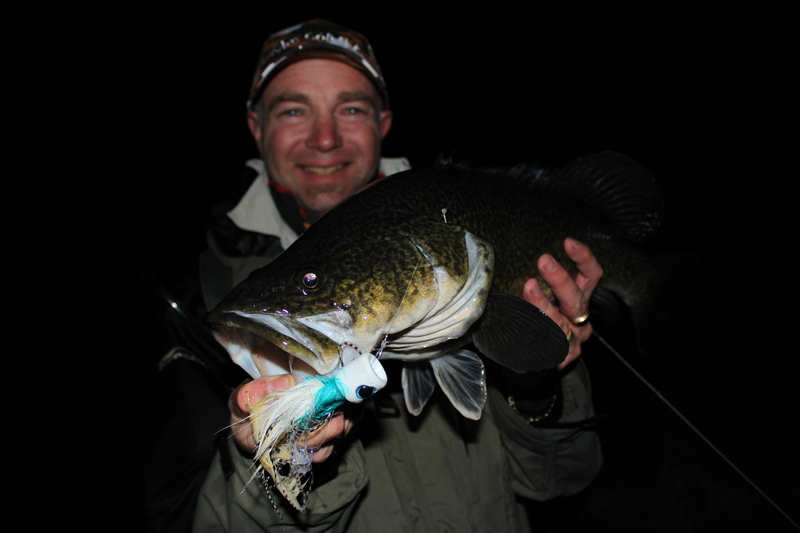 Murray cod, fly tying video – Rattling Deceiver…..
Winter Murray cod Fly Fishing….. Fly fishing is art! There is an innate beauty in a fly cast. There is a sense of satisfaction and wellbeing that comes from standing in a river or on the river bank. A rhythmic cast of a fly line back and forth. It’s a sense of being in time with nature, in tune with the solitude of the great outdoors being a part of the whole sentry. The fly line gilding through the air, unrolling, seems weight­less as it appears to defy the law of gravity. Fly casting has a poetic nature all on its own, there is a connection here; it’s with the heart of the game. In fly casting we attempt to cast an almost weightless artificial fly, made of feathers, hair and thread. To target and present that fly in a manner that will imitate a natural food source. In Fly Casting the line itself is the weight and the fly is along for the ride. I have spent just over 5 years learning and yet there is always more to learn. Every step of the way has been enjoyable just pure fun and accomplishment. It’s not hard anyone can do it. It just takes a little practice. 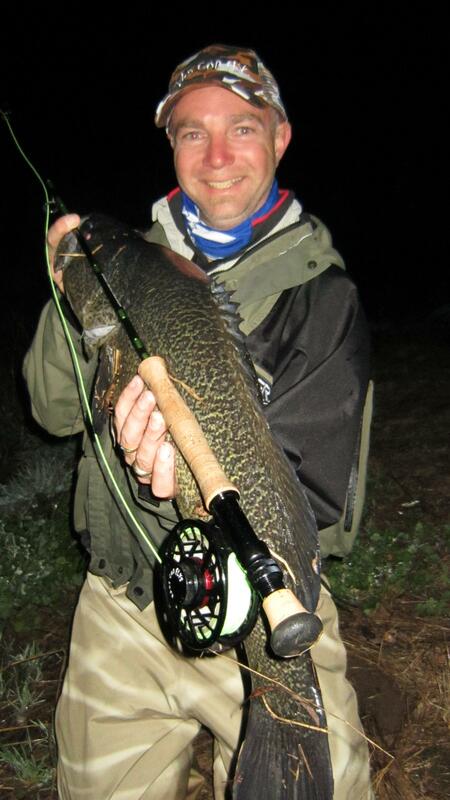 The only difference between a good fly caster and a Master is practice! Flicking a fly rod around it’s very important to get the fly in the right location, close to the structure. A fallen tree, weed-beds, rock points also casting very close and tight against the bank. Surface fishing flies hard up against the bank in a foot or 2 of water is a blast; the strike is instance, with the cod attacking the fly as soon as it hits the water. A shot gun sound rings though your ears and the commutation of a crocodile drag a deer in to the water is how I can explain it. 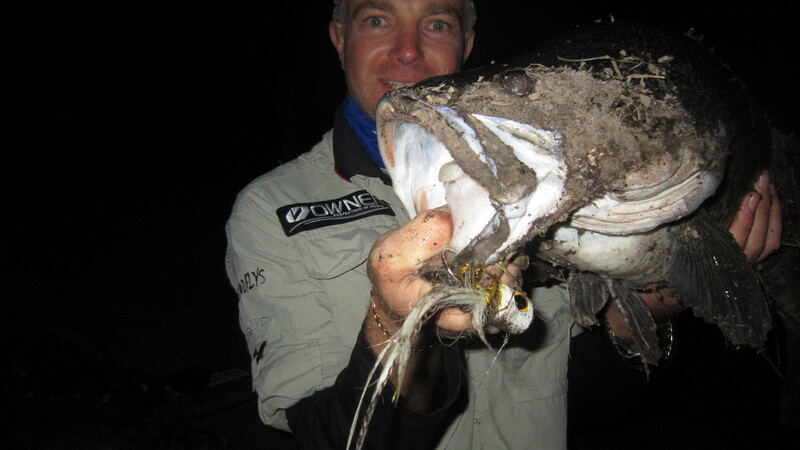 Murray cod lurking the warm water edge looking for a free feed is common at winter time. 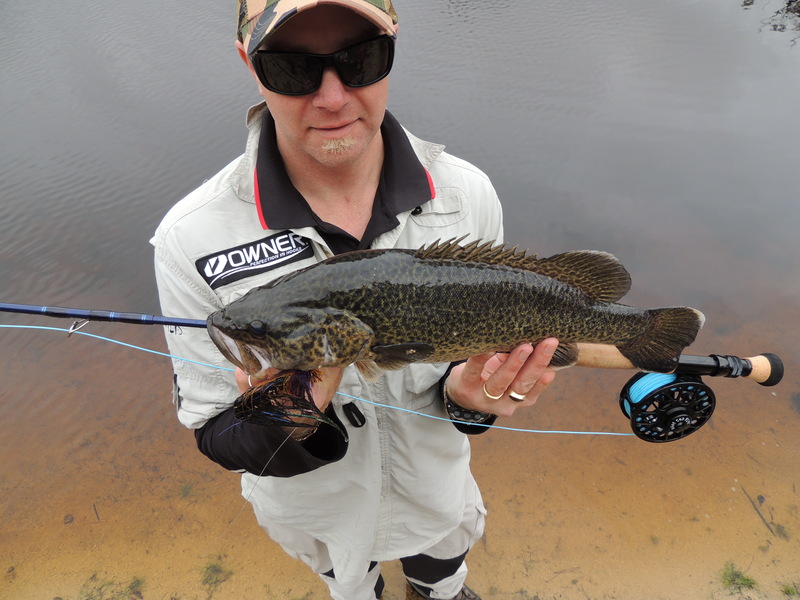 On occasions I have seen the dorsal fin of a Murray cod in the shallows chasing bait fish, shrimp, yabbies or waiting for that unfortunate of a frog leaping in to the water. Vibrations, movement and noise on the water is what the cod is after, not a huge racket but enough to get the cods attention to make him interest. 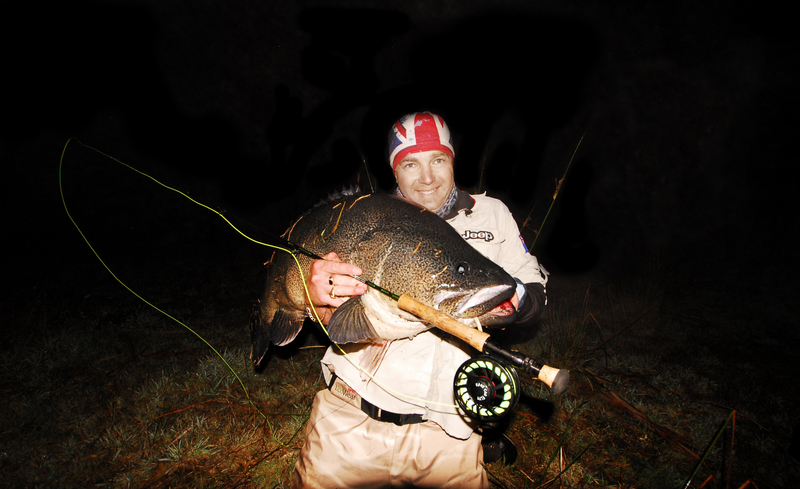 Late cool evenings and right in to the early hours of the morning is a prime time to pull out your rod and give surface fishing ago. Calm waters with no wind or breeze, not even a slight ripple on the water makes exciting surface fishing during winter! Winter weather conditions such as; Barometer – rising or falling, warm winter days, wind direction though out the day; moon phases, fog and fly placement. A falling barometer I personally like and with that I hit the water fishing at its lowest point. Combined with a moon phase in the 75% to 85% range, which is 3 or 4 days before a full moon. 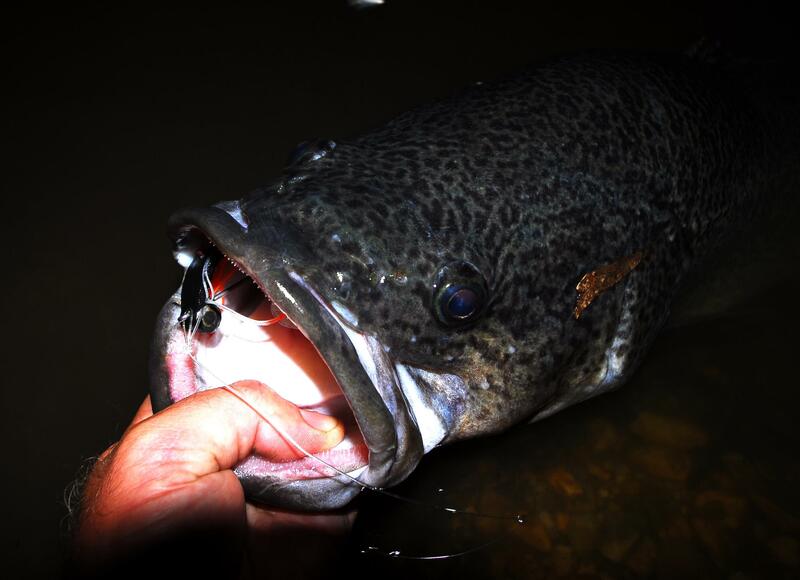 Striping the fly back with quick tight strips in a straight line – keeping the rod tip close to the water surface, may resemble a frog trying to get back to a safe place. Tie a loop knot to connect to the fly as this allows free swimming action of the fly. Pause the fly and if you wish count down several seconds to, this may be the difference to no strike to a big boof! These techniques’ work fantastic with a floating line but can have a similar affect using an intermediate line. 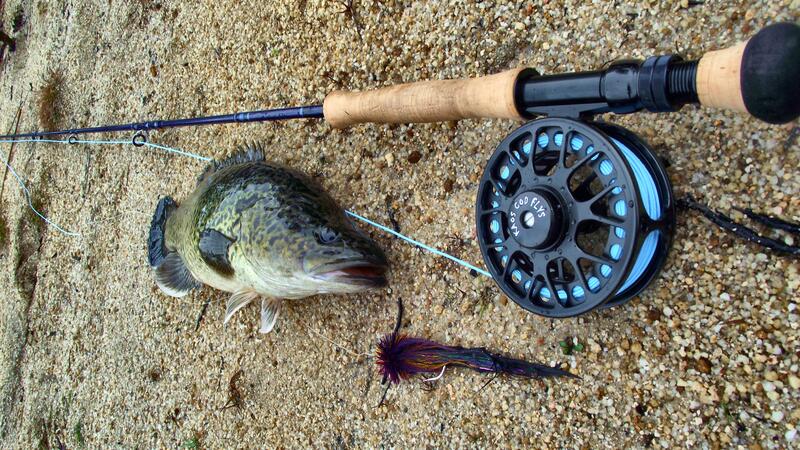 Effective way of fishing surface is by using a floating line with mono leader. The mono line sinks enough; so when the fly is striped quick the fly will naturally go under the water surface and make a gulp, noise. Once you have stopped it will resurface like a small injured animal as it tries to grasps for air. The fly leave’s a bubble trail behind it with this technique with floating line but even larger if it was striped with intermediate line. The talk of the day and weeks to come will be all about you landing a fish on fly. Maybe you’re first time or the hundredth time, for me it’s always a great feeling and for your fishing partner as they get involved too by netting the fish.